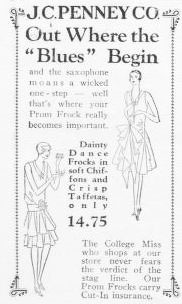 Out where the "Blues" being and the saxophone moans a wicked one-step - well that's where your Prom Frock really becomes important. Dainty dance frocks in soft chiffons and crisp taffetas only $14.75. The college miss who shops at our store never fears the verdict of the stag line. 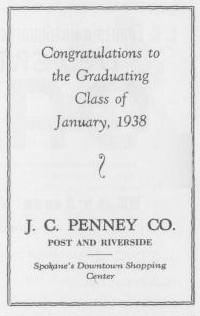 Our prom frocks carry cut-in insurance. 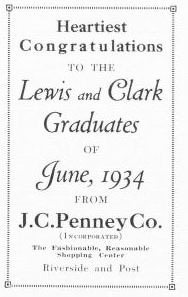 Heartiest congratulations to the Lewis and Clark graduates of June, 1934 from J.C. Penney Co. 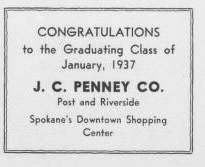 The Fashionable, reasonable shopping center.